Finally a tea companion to the roadside attraction / big coffee pot series! This is definitely one to add to my travel plans. 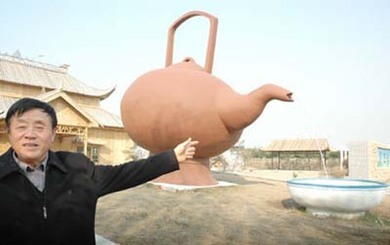 If I ever get to China to visit the Tea & Horse Road, this will be on my list of other places to visit! It's located in Changshu, in the Jiangsu province of east China. 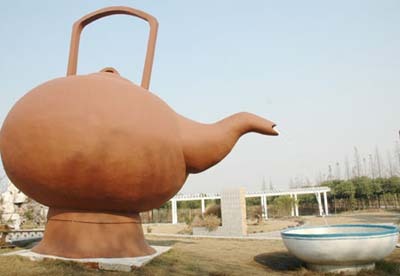 A ginormous teapot (5.5 meters tall) is pouring "tea" into a bowl. Made of reinforced contrete, it took five artisans thirty days to finish. Isn't that cool, Nik? Hey Tom, that's not so odd, it was in the news. Just FYI though, if I find an article through another blog, I'm pretty good about giving credit for it. Found via ... etc. I think it's only fair. I wish other people would do the same, it would add to the linky love pool. Thanks for the heads up about your domain. Tom here from the Tea Room Appreciators. It's odd, but we ran a similar story the other day - check it out. 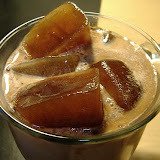 While I'm here, the address has changed (we've got our own domain now) to: http://tearoomappreciators.com.